Mary Ellen's Cooking Creations: Spinach Pie - Let's Do Brunch! Over Easter weekend, my parents cooked a fabulous Polish feast. We had everything from potato pancakes and galumpki to kielbasa and sauerkraut. We all ate way too much, but it was SO worth it! I'll be posting a recap soon. Because we had our big dinner on Saturday, I decided to host brunch on Sunday morning. 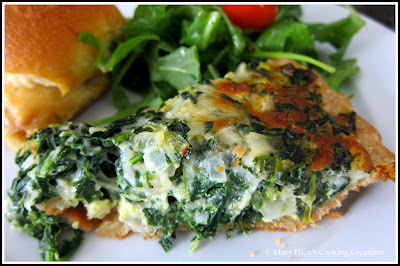 One of my main dishes was this incredible Spinach Pie. 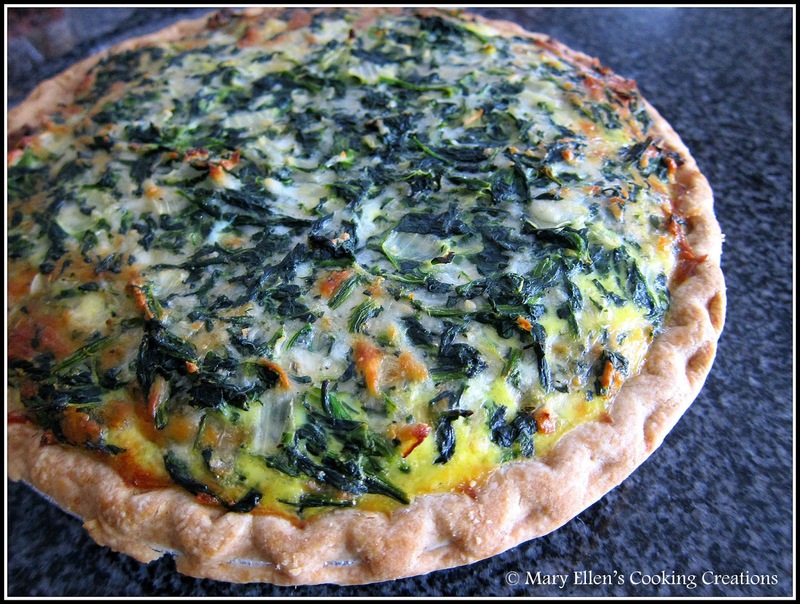 The author of the blog Dainty Chef suggested I include it on my menu, and I'm glad she did. When planning my menu I wanted things that would be easy to prepare since we'd be spending most of our morning with our daughter hunting for eggs and checking out what the Easter Bunny put in her basket. 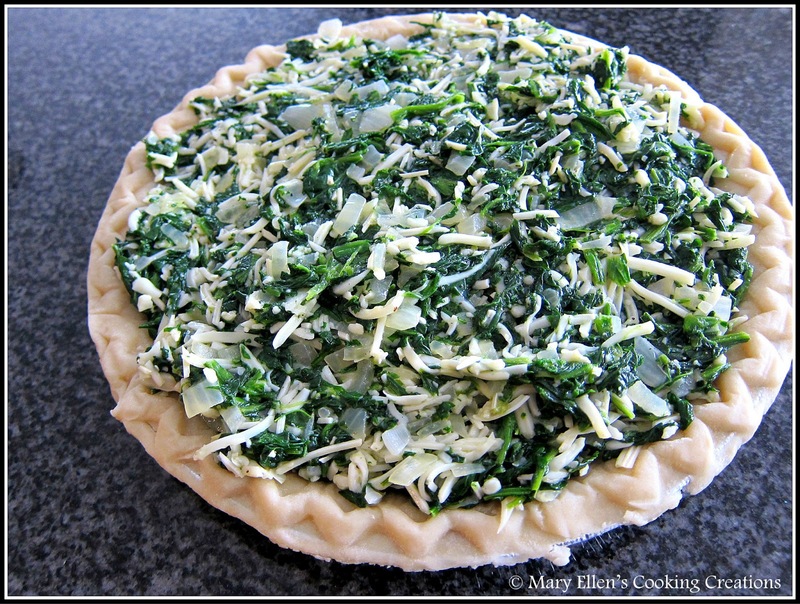 This pie was super easy to prepare, especially because it I used a frozen pie crust. I followed the recipe exactly, and actually had more filling for the pie than I needed, so I think the ingredients could be cut down, or you could make one regular sized pie and maybe one single-serving pie or crustless pie in a ramekin. One note - it's really important to let your spinach thaw and then to press out all of the water. Don't try to rush or skip this step! Everyone loved this pie, and it was awesome to have some leftovers for lunch the next day. Heat olive oil in a saute pan; Saute onions in pan until tender. Thaw spinach, make sure to squeeze out excess water. In a large bowl, combine spinach, onions, cheeses, eggs, and seasonings. Mix well. Pour into prepared pie crust and bake for 40 minutes. 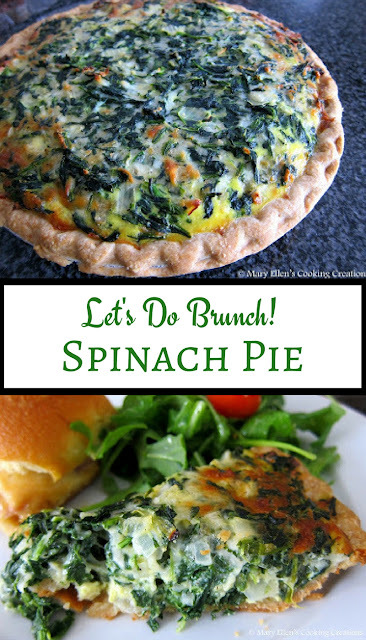 This looks like a perfect brunch item! I can't wait to try it out! Looks so good! 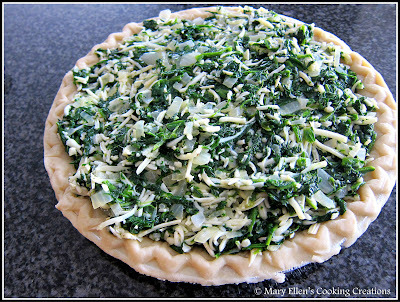 Do you bake the pie crust before putting in the spinach mixture or do you just put it in a thawed pie crust? Hi Danielle - thanks for commenting! I did not pre-bake the pie crust and it was nice and crispy. Glad you enjoyed it! I love to eat it all week long with a side salad for lunch! Glad you enjoyed it! I like to make it on weekends so I have a piece for lunch all week long!